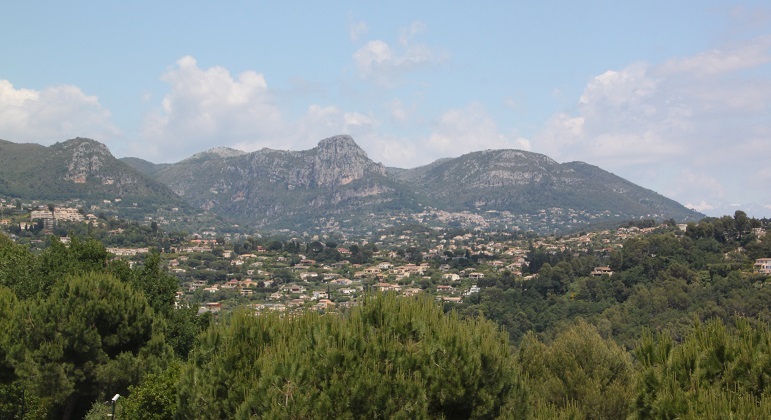 Just ten minutes drive from Vence is the equally gorgeous but far more touristy St Paul de Vence. 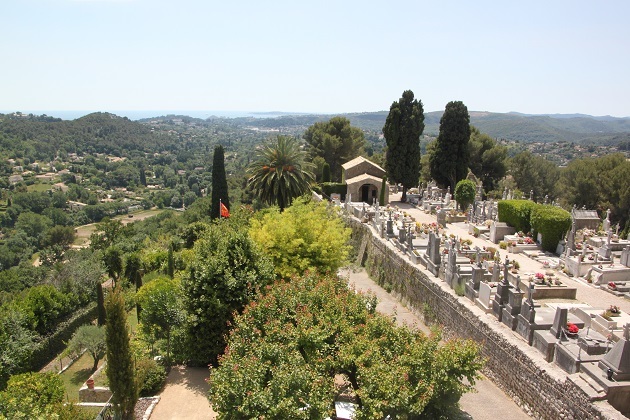 Tourists flock here and crowds are so not my thing but I have to say, despite all this the ancient charm of St Paul de Vence is not lost in any way. 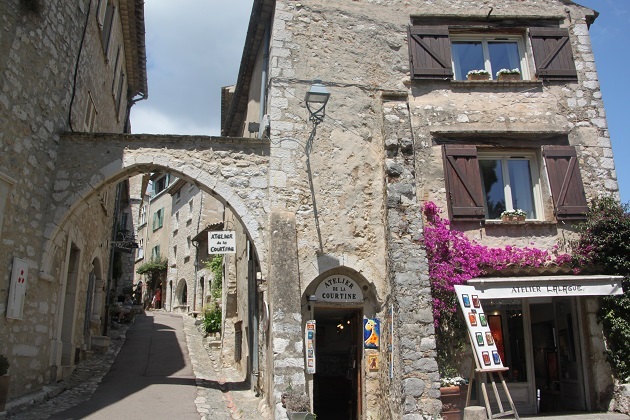 This is a gem, surely it must be one of the most beautiful villages in France. 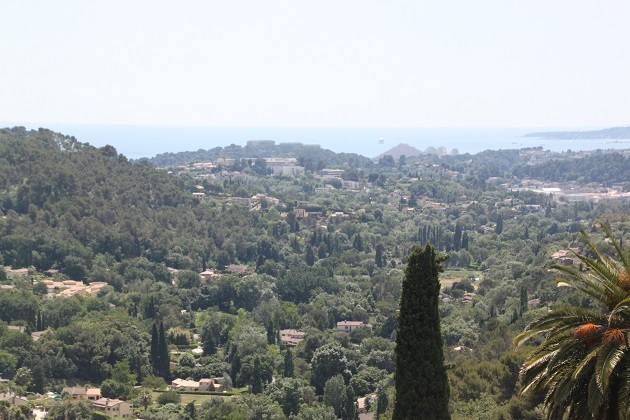 We found a parking spot on the main road just down from the Fondation Maeght and walked a short way to the village. At first glimpse, sitting on its rocky outcrop you know this place is going to be special. 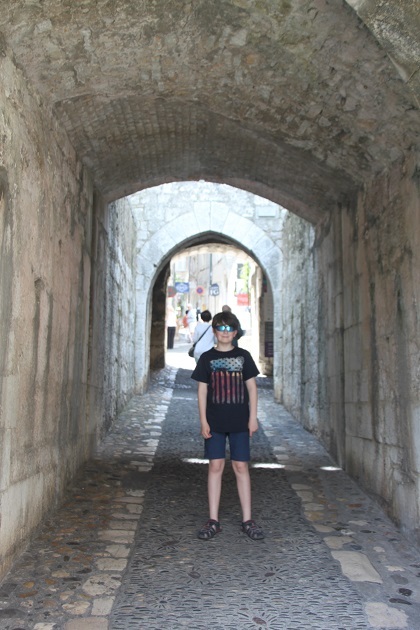 We entered via the original stone gateway through the 16th century ramparts. 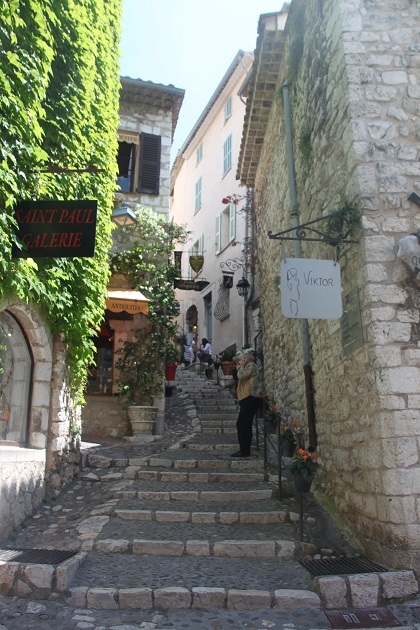 The main street runs from one end to the other, is narrow and cobbled and has a couple of side streets to explore. We just wandered. 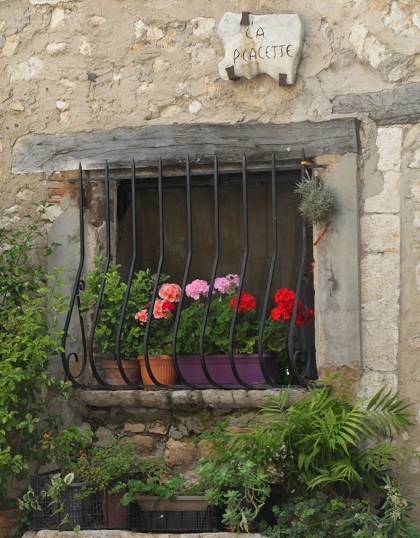 There are so many attractive medieval houses and lovely facades and some have statues tucked into nooks in the walls. There are loads of art galleries, cafes, art and craft shops and so much to take in. 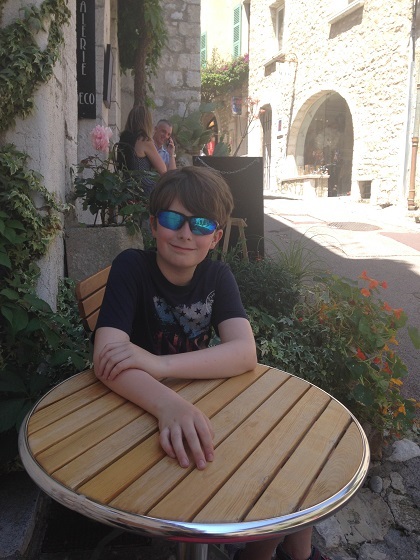 Son found an ice-cream shop pretty much straightaway – lavender flavour went down very well with me. 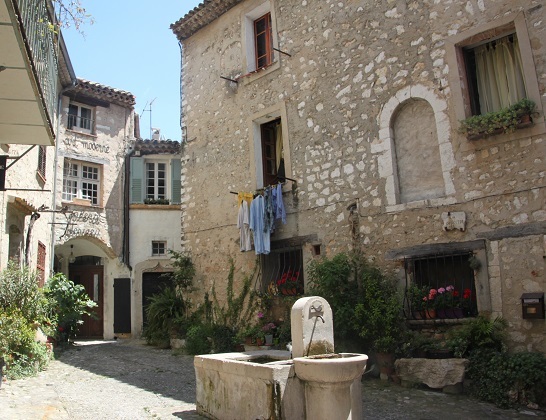 There are elegant fountains in the middle of the village and vine covered stone walls. Even the ground is gorgeous as the cobblestones are laid into the shape of flowers. We strolled right to the far end and found the belvedere. Magnificent views over the hills to the sea beyond. 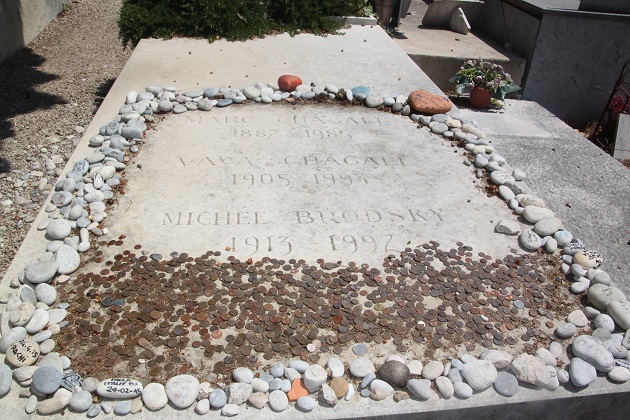 We went into the quiet little cemetery and found the grave of Chagall covered with coins and pebbles. Back up through the main street, we stopped off at a little cafe, sipped drinks sitting in the sunshine and just soaked up the wonderful atmosphere of this special place. I love those really old villages where you can only walk the small stone streets! This one is perfect like that Erika. Yes, like from a movie. Beautiful! It was fairly busy and there were several coaches around Rosemary but somehow we managed to get pictures without people in them!! Not sure at all how that happened. It was such a beautiful village, we’d been before years ago but I was just as overwhelmed this time! Hope your week is going well too. i’ve never heard of this place but it looks absolutely amazing! so picturesque! It’s a gorgeous village – around every corner is another perfect view. It is one of the most beautiful villages we’ve seen for sure. 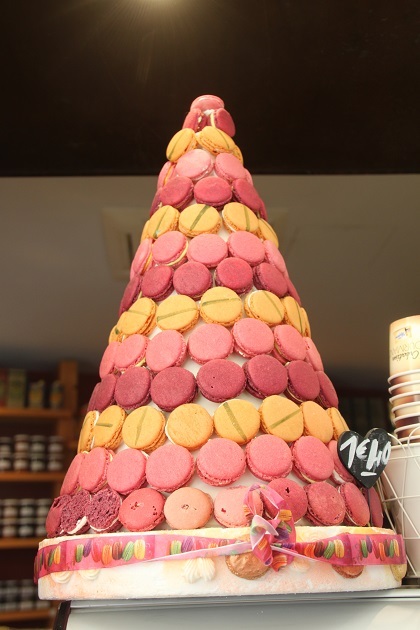 We love mararons too Pam – mouth watering!! It is a really pretty little place, around every corner is another gorgeous view, wonderful for strolling. 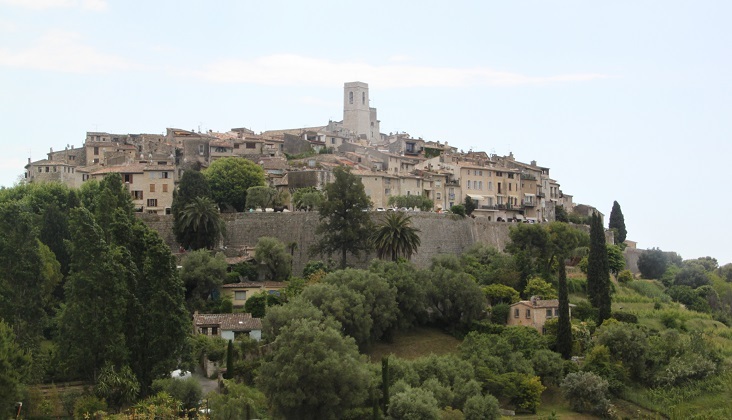 St Paul de Vence looks gorgeous, those cobbled streets just transport you back in time. 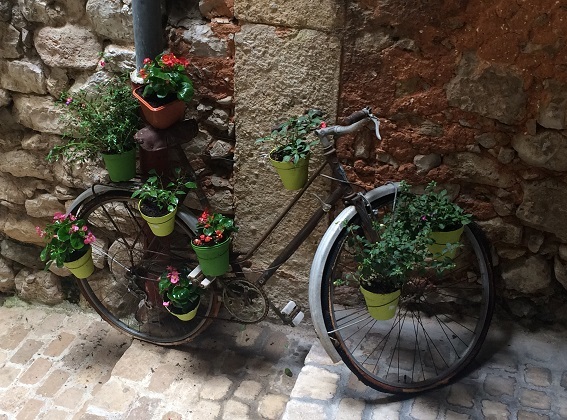 I especially love the bike adorned with flowerpots! I loved that too – such a great use for an old bike! It is such a pretty little place, gorgeous views and lovely quaint little shops as well – my idea of perfect! I think we must have been lucky with the pictures – there were lots of people around that day but we managed to not get most of them in our photos!! There were lots of tour buses and plenty of people around Suzanne, somehow (not quite sure how it happened) we managed to snap some photos without the crowds!! It’s so gorgeous Lara, looking back at the pictures brings back some lovely memories of wandering around those gorgeous streets. We are enjoying some unexpected sunshine here – an Indian summer which is more than welcome! Great post! The cobble stone designs are so lovely! Did you know that placing a stone or pebble on the grave is a jewish tradition?! I loved that even the streets in this place are gorgeous!! I did know that about the stones on the grave and think it’s a lovely tradition. Gorgeous, Joy. We loved this place and your photos reminded me why. Such a unique little spot. It’s a gem isn’t it George, despite all the crowds it remains special and unspoilt. I’m always drawn to cemeteries too, they reveal so much about a people. 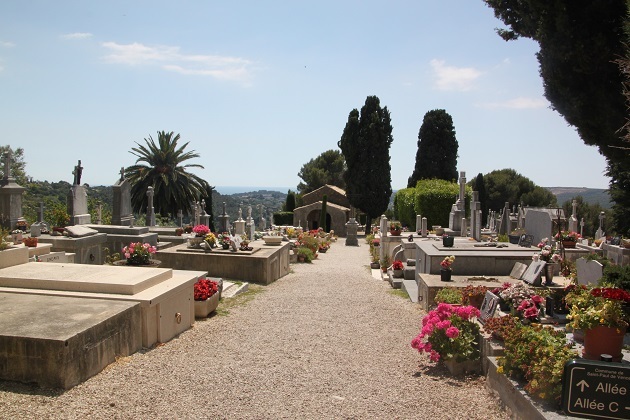 They’re so fascinating – any place we go if there is a cemetery around we always pay it a visit! It looks blissful. We haven’t visited there but it’s definitely my sort of place! 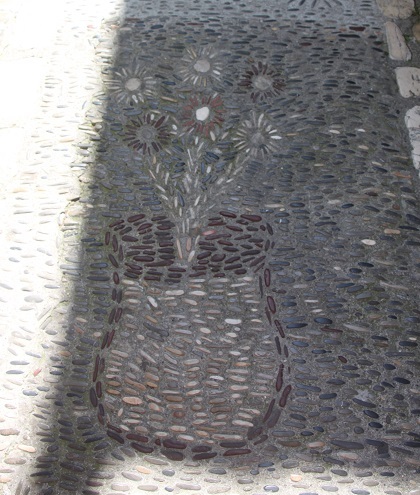 I love the cobbled stones with floral designs but in them. We never seem to find things like that here! It is such an incredibly popular village but so beautiful that you can deal with the crowds and it’s absolutely worth all of that. Those pavements – a simple idea but so lovely, we just make do with the concrete slabs!! He was more than happy to be sitting sipping on lemonade hence the grin!! He’s growing up too fast, time slow down…. What a gem of a town, so beautiful. I could get lost and explore there for a day or 2. We only had a few hours there Terry but I totally agree with you, a couple of days just wandering around those gorgeous streets and checking out the little cafes would be perfect for me too. You definitely need sturdy shoes Diane!! But the pavements are gorgeous – we loved everything about the little place too.